If you’ve ever wondered whether you should be taking advantage of the historically above average returns of small stocks, value stocks, momentum stocks, and other types of market anomalies, Your Complete Guide to Factor-Based Investing, by Andrew Berkin and Larry Swedroe, is the book for you. It’s based entirely on “evidence from peer-reviewed academic journals,” and it helped me focus my thoughts on the degree to which I want to pursue factors. The authors begin with a treatment of the seven factors they consider “worthy of investment”: market beta, size, value, momentum, profitability and quality, term, and carry. For each of these factors they discuss persistence, pervasiveness, robustness, whether they are investable given real world concerns such as trading costs, and whether there are logical explanations for the existence of above-average returns. In the case of size and value factors, “While small-cap stocks as a whole have provided higher returns (the size premium), small-cap growth stocks have produced below-market returns.” This is the reason why I invest in the exchange-traded fund VBR; it contains only small value stocks. Financial institutions “are momentum traders, while private households are instead contrarians taking the other side.” If this is representative of who makes money from momentum and who loses, the ever-shrinking role of private households as direct stock investors would seem to point to a reduced momentum premium in the future. But I’m not making any predictions. “While momentum has offered investors the highest risk-adjusted return of all the factors we have discussed, it also has a ‘dark side’ – it has experienced the worst crashes.” That’s enough to scare me off momentum investing, particularly now that I’m retired. The carry factor consists of assets that yield a high return if the asset’s price remains the same. One example is choosing to hold the currency of a country with high interest rates. “Carry can be like picking up nickels in front of a steam roller. It has been profitable of the long term, but one must be sure they can handle being run over every so often.” That leaves me out. Throughout the book, each factor always gave impressive-looking returns, but the section on implementing a diversified portfolio of factors gave a single example where using factors boosted market returns by 0.3% annually, and standard deviation dropped by 1.8%. This shows that those readers who don’t understand the math behind the analysis can be fooled by seemingly big factor returns. The book contains ten appendices, including one on smart beta: “while there really is in fact such a thing as smart beta, much of it is nothing more than a marketing gimmick – a repackaging of well-known factors.” Other appendices explain why dividends are not a factor, and why other possible factors were rejected based on the authors’ criteria. In an appendix discussing the default factor for corporate bonds, the authors point out that “Like many risky assets, high-yield debt does not have a normal return distribution.” This criticism extends to virtually all of the academic analysis this book is based on. Stock returns don’t follow the normal distribution, making discussions of volatility, Sharpe ratios, and the entire capital-asset pricing model (CAPM) suspect. It’s a lot to ask, but I’d like to see factor analysis using a pricing model built on a stable distribution that better follows the fait tails we actually see in stocks returns. No model is perfect, but the normal distribution underestimates the probability of extreme events by such a huge margin that it treats extreme events essentially as though they can’t happen at all, which is dangerous. The final appendix lists mutual funds and exchange-traded funds that give access to the investable factors. Some of the funds have quite high expense ratios. This represents costs that you pay whether the factors deliver higher returns or not. If we add other fund costs such as trading costs to the expense ratios, and we eliminate funds whose costs are above, say, 0.25% per year, some factors no longer seem investable. Overall, I found this book very helpful in understanding factor-based investing. However, it’s not for the casual reader. A decent grasp of CAPM is needed to follow the discussion well. I don’t know if I’ve chosen the right level of factor tilts for the stock portion of my portfolio (80% market beta and 20% small value), but I’ve made my peace with my choices. For years, a big personal financial focus for me and my family has been making annual RRSP contributions, but no more! I’m done with RRSPs. Or at least I’m done with contributing to them now that I’m retired. It’s a strange feeling to contemplate starting to withdraw from RRSPs/RRIFs. Long-time successful savers often have a hard time turning off the saving habit, and I’m no different. My spreadsheets that contain multiple layers of conservative assumptions tell me how much I should be spending each month, but I rarely get there. RRSPs are a great personal finance tool to reduce income taxes over a lifetime. But, barring unforeseen new sources of income, I expect that the RRSP room created by my 2017 income will go unused. Instead, I expect to make annual withdrawals starting at the end of 2018 to use up my lightly-taxed income room. I’m interested in hearing from others about how it felt to transition from being savers to spenders. 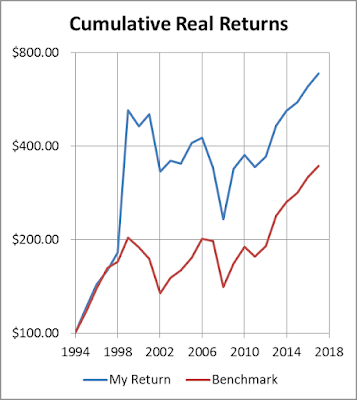 Over the decades it’s been getting harder to beat the average returns of purely mechanical investment strategies according to Larry Swedroe and Andrew Berkin in their book, The Incredible Shrinking Alpha. Looking for superior stocks may have been profitable many years ago for intelligent investors with the right temperament, but even the most brilliant money managers today usually fail to beat the markets. In this short book, the authors go through their reasons for why markets have been getting tougher: there is less “dumb” money to exploit, the market is being “overgrazed,” and “the level of competition is getting ever tougher as better data and technology are used by ever more skilled managers.” Then they go on to give their prescription for how you should invest your money. In the article Measuring Stock-Picking Skill, I explained the meanings of the terms alpha and beta in this context, and why I don’t fully agree with the authors when they try to prove that past successful investors didn’t have stock-picking skill. I won’t repeat this here. To beat the market, you actually have to outperform other investors. To buy a stock that is cheap, you have to buy it from someone who is foolishly selling the stock at too low a price. So, if it were easy to beat the market there would have to be a large pool of terrible investors giving away their money. However, “there has been a substantial downward trend in the fraction of U.S. equity owned directly by individuals.” As time has passed, more and more assets have been controlled and invested by professionals. Passive investors may get higher returns than the average active investor, but “Active managers play an important societal role—their actions determine security prices, which in turn determine how capital is allocated.” “Passive investors are ‘free riders.’” So, active investors benefit us all, but end up with lower returns, on average, for their trouble. One of the reasons why alpha is hard to find is that “Alpha is a finite resource” and there are many brilliant professionals chasing their share. The authors’ prescription for how individual investors should handle their savings is diversify, invest in passive funds, and keep costs low. I think this book is worth a read, especially for those who try to pick their own stocks. You should either convince yourself that the authors’ arguments don’t apply to you (I know they apply to me) or invest in indexes. The Blunt Bean Counter brings us a thoughtful and balanced discussion of the minimum wage hike. He also discusses the importance of executors advertising for creditors. Robb Engen at Boomer and Echo switched to index investing 3 years ago, and he explains how this has affected his life in terms of time, stress, and portfolio returns. Canadian Couch Potato gives the Couch Potato portfolio returns for 2017. He also has a new podcast out where he interviews Shannon Lee Simmons, a fee-only financial planner and author of Worry-Free Money. During the podcast he explains that while cryptocurrencies may take over the world eventually, there is no guarantee that Bitcoin will be the winner. I’d say it’s not even likely. Gail Vaz-Oxlade gives step-by-step instructions for getting out of debt in just 40 lines. John Robertson compares the costs of Robo-advisors and DIY investing approaches. His comparison is relevant to those who could handle any of the choices but are looking for the right personal cost/hassle trade-off. Big Cajun Man anticipates the day when we’ll interact with large businesses through chatbots. I’m not sure how widespread their use is right now. Stock markets gave us above-average returns again this year, even measured in Canadian dollars that rose in value relative to U.S. dollars during 2017. My internal rate of return (IRR) that takes into account cash flows was 12.17%. A big change for me this year is that at mid-year I retired from my job. It was a tough decision to walk away from a comfortable income, but the family portfolio sits at about 35% above what I calculate we’ll need to make it to age 100. This is a pretty healthy margin in case the stock market crashes, perhaps even healthy enough by my wife’s standards. I don’t know if I’ll stay retired, but I seriously doubt I’ll ever work full-time again. I may do consulting work if the mood strikes and the work is interesting. With retirement comes some fixed-income investments. I’ve written before about my intention to keep 5 years’ worth of family spending in safe investments. So, my portfolio that used to be 100% stocks now contains cash and GICs. The percentage in cash will grow with my age according to my spreadsheet calculations. My benchmark changed for this year as well. In addition to fixed allocations to exchange-traded funds VCN, VTI, VBR, and VXUS, my benchmark has an allocation to cash. My benchmark return for 2017 was 10.60%. My actual return was higher primarily because I was slow in selling stocks to create cash. My returns were boosted by the ever-rising stock markets. If stocks had crashed, I could have lost out by not filling my cash allocation immediately. I have a spreadsheet set up that dictates all my actions with the ETFs in my portfolio. I do this to eliminate making my own foolish choices in the moment. I haven’t yet automated the cash part of my portfolio. This happened to work out well for me this year, but I prefer to automate everything and wait for my spreadsheet to tell me what to do. I had a spectacularly lucky 1999 where I took a wild chance and won. 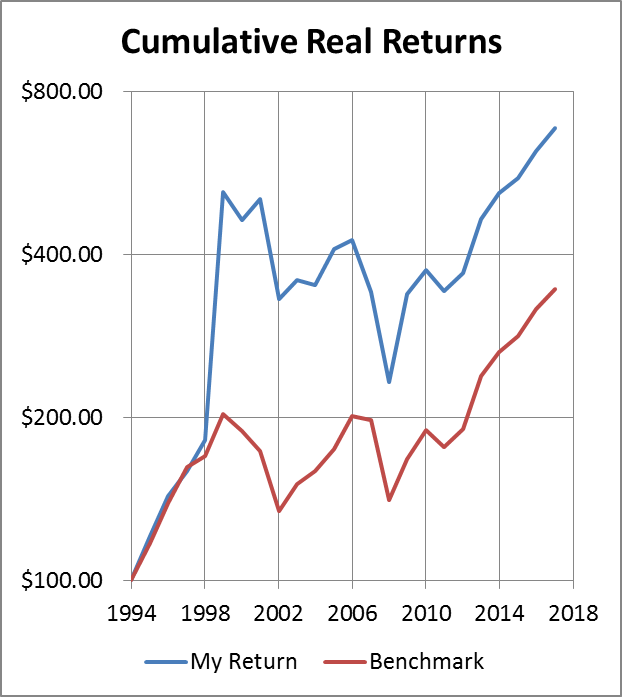 For the next decade I gave away some of these gains, and for the last several years my indexed portfolio’s actual returns haven’t deviated much from my benchmark returns. It’s good to know that the money I had invested in 1994 has grown to the point where it can buy 7 times as many loaves of bread. Over my investing history, my compound real return (which factors out inflation) has been 8.72% annually. I have outperformed my benchmark by a compound average of 3.02% annually. Both figures are almost certain to drop in the coming years. For planning purposes, I assume that my stocks will average 4% above inflation, and that cash will just match inflation. It’s inevitable that your portfolio actions won’t exactly match your investment plan, even if you’re an indexer. In part, I do these calculations to see whether the deviations from my plan are costing me money. When you think you’re being clever, it’s important to see if in reality you’re being dumb, unless protecting your ego is more important to you than money. The plight of Sears Canada pensioners has been in the news lately. After reading about the hardships created by pension cuts, it’s natural to think about what we should do to prevent this in the future. Some, like Jen Gerson, question whether pension plans should have higher priority than they do now when divvying up the assets of a bankrupt business like Sears Canada. However, the side effect of doing this is that suppliers would be less willing to extend credit to any business with an underfunded pension, and this would drive struggling businesses into bankruptcy sooner. This is a difficult choice to make when you’re still hoping that a weak business can get back on its feet. However, the Sears Canada case looks far different from a plucky business doing all it can to survive. “While Sears’ shareholders pocketed payouts of $3.5 billion, the chain’s pension plans remained underfunded to the tune of $270 million.” Why are owners allowed to pull assets out of a business that owes money to its pension plan? I can see where a company with a regular modest-sized dividend might be harmed if it’s forced to suspend the dividend. However, in this case, Sears Canada paid special large dividends. It seems appropriate to me to limit a company’s ability to pay dividends while its pension plan is underfunded. By itself this won’t prevent all cases of pension cuts, but it would make it harder to drain assets from a business at the expense of pensioners.